You are here: Home / Dice Games / Rory’s Story Cubes Review- Let the Good Times Roll with Your Imagination! 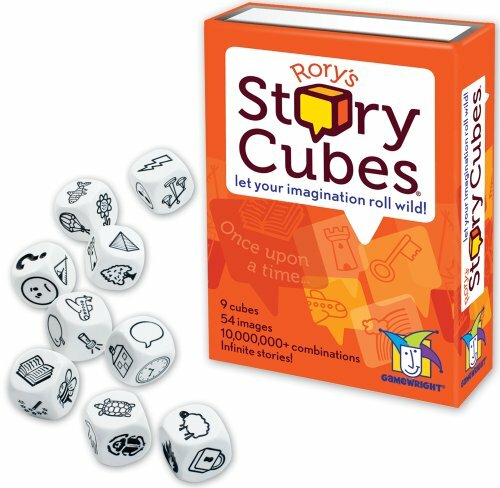 Rory’s Story Cubes Review- Let the Good Times Roll with Your Imagination! Today, most kids and parents spend a considerable amount of time on digital devices. Also, family lives, in general, seem to get busier and busier all the time. These two things have negatively impacted the amount of quality time that families spend together. As a result, many families are making time to unplug a priority, including ours. There are lots of different things people are doing with this prioritized together time, as little or as much of it that they have. A board game or an afternoon of playing in the backyard are a couple of popular ways we like to be together off our phones and laptops. But what if you’re more strapped for time? We found the perfect thing. Rory’s Story Cubes are a set of 9 high quality 6 sided dice with unique images on each of the sides (54 different images total). Designed by Rory O’Connor an Irish trainer of creative problem solving, the images are meant to inspire creativity and storytelling. Let me tell you they certainly do! Rory’s Story Cubes are more of an activity than a game. It is a pocket-sized imaginative story generator great for minutes or hours of creative play for young and old. Rory’s Story Cubes are recommended for kids 8 years old and up. We think kids as young as four can play with them and create great stories! The cubes are small, as I mentioned above, they could fit into a pocket with no problem. They are not recommended for kids three and under as they pose a choking hazard due to their size. Great for one or more people but we find 2-4 people works best. Takes as little as 15 minutes to play. Teaches imaginative storytelling and creativity. Inspires active listening and develops communication skills. The game is comprised of nine jumbo dice with different creativity inducing images on each of the six sides. All 54 images can be mixed 10 million different ways. Set up is insanely quick and easy, one player dumps the cubes out of the cube bag and play begins. There are many ways to play with the cubes. In fact, the instructions for the game say there are infinite ways to use them! Sounds a little daunting, doesn’t it? Don’t worry, the people who make the cubes, Gamewright, offer three different way to play to get your creative juices flowing. Once upon a time….. A player takes all nine cubes and rolls them. Then the player organizes the images to tell a story (cube one is the beginning and the rest of the remaining eight cubes are used to create and conclude the story). The player introduces their story with “Once upon a time” and weaves a story by connecting all nine images to create the narrative. Title first- story second….. A player creates a title for their story like “ A Kids Best Day Ever” then rolls the cubes and weaves the story to support the title using the images. The cooperative story….. The players share the cubes amongst themselves. It’s okay if some players have more than others. Player number one rolls their cubes then selects one image then places it in the middle of the play area. They then begin the story using the image in the center as their inspiration. Player two then rolls their cubes and places one image in the middle next to the first cube and continues the story and so on until all the cubes have been used. There really are infinite stories that can be created with the 54 images, just let your imagination be your guide! Rory’s Story Cubes offer a great way for families to unplug and spend time together (even if you only have only 15 minutes to spare). Also, the game inspires creativity and imagination which could lead to more unplugged play time for both you and your kids! It’s quick and easy to play,15 minutes or so and an imagination are all that’s required. Play promotes active listening, creativity, and vocabulary. The activity is small, the cubes and their bag can fit in the palm of your hand making it great for taking it anywhere. The flexibility of the game with different modes of play and the infinite number of unique stories that can be told. There are no cons to Rory’s Story Cubes. How can there be when the activity is all about using your imagination! If playing with younger kids sometimes they’re storytelling can be inhibited because they become too fixed on each image. To help them think a bit differently use an example like this; one side on a cube has a picture of a lightning bolt which could mean just a lightning bolt or it could mean a terrible storm or fast as lightning. Rory’s Story Cubes are a fun, quick and easy activity for families to play together! Game setup and clean up are next to nothing. It’s delightfully compact, it can fit in the palm of your hand, so it’s great for travel, camping trips, or to take anywhere really. The different modes of play combined with the 54 images offer millions of different story combinations. 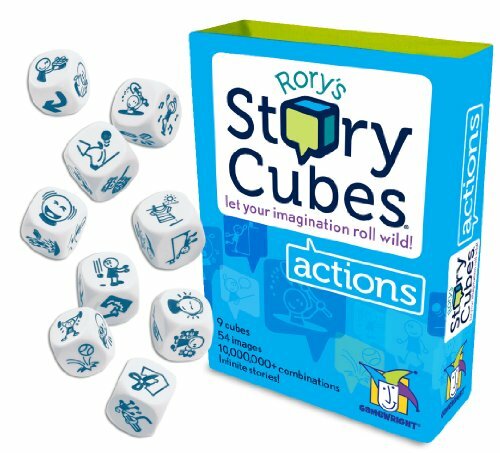 Rory’s Story Cubes Actions– Add action and movement to your stories with this set of nine cubes. Roll them with the original Rory’s Story Cubes and create even more action-packed story combinations! This set is great for developing language and teaching verbs. 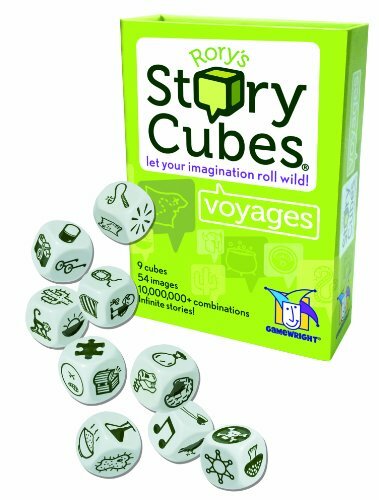 Rory’s Story Cubes Voyages– Add journeys and discovery with this set of nine cubes. 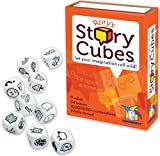 Fun to play on its own or mix with any of the other Story Cubes sets to create even more story combinations! Battle Sheep Review - Wooly Warfare!